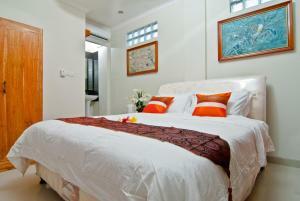 D'Pande Guest House - Kuta, Bali, Indonesia - Great discounted rates! 7.5 out of 10 based on 3 verified user reviews via Agoda. Set in a prime location of Bali, D'Pande Guest House puts everything the city has to offer just outside your doorstep. The hotel offers a wide range of amenities and perks to ensure you have a great time. All the necessary facilities, including free Wi-Fi in all rooms, daily housekeeping, private check in check out, taxi service, ticket service, are at hand. Comfortable guestrooms ensure a good night's sleep with some rooms featuring facilities such as television LCD plasma screen, clothes rack, mirror, private entrance, towels. The hotel offers various recreational opportunities. Discover all Bali has to offer by making D'Pande Guest House your base. D'Pande Guest House - Bali classifies itself as a 2 star hotel.